Andre Luis Azevedo. Jose Junior. Michele Moraes. Anderson Sa. Zuenir Ventura. Documentary. Music. Civil Rights. Gangster/Mob. 1990s. Medical. Drugs Related. 01 Nigel's Choice. Guns. Black Interest. Recommended. Favela Rising documents a man and a movement, a city divided and a favela (Brazilian squatter settlement) united. Haunted by the murders of his family and many of his friends, Anderson S�, a former drug-dealer, turns social revolutionary in one of Rio de Janeiro's most feared slums. 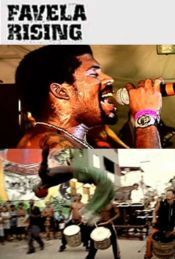 Through music, the rhythms of the street and Afro-Brazilian dance he rallies his community to counteract the violent life offered by the drug armies and sustained by corrupt police. But even as liberation looms tragedy is never far away. Favela Rising has won several awards for its daring look at life in Brazil's slums.